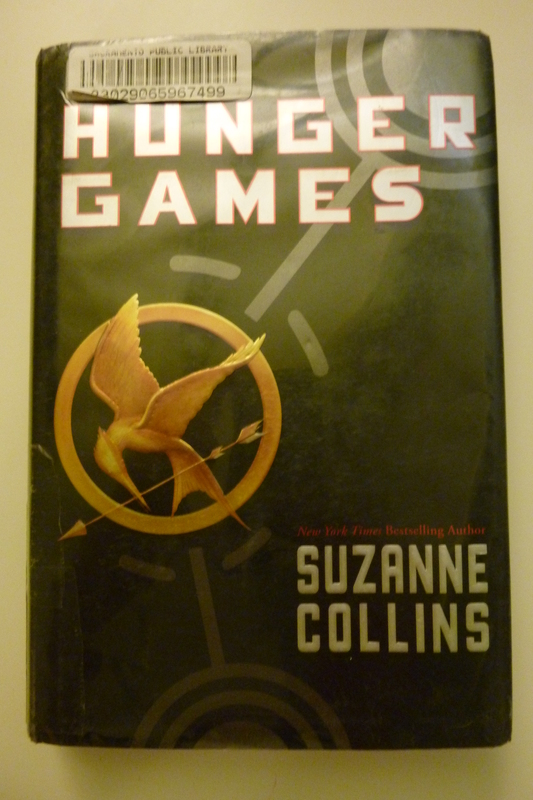 If you follow any other YA book blogs, odds are you’ve heard about The Hunger Games by Suzanne Collins. They seem to be the latest sensation in YA literature. I’m coming to the game (so to speak) a little late, as I finally picked up The Hunger Games just recently. It’s darker than my usual fare–but it turned out to be excellent. In case you haven’t heard about it, The Hunger Games is set in a future dystopia, where society is organized into one wealthy capital and twelve surrounding districts; it reminds me somewhat of ancient Rome and its provinces, and of South Africa’s townships. Seventy-four years previously, the districts rebelled against the capital. They were crushed, and ever since have been forced to participate in the annual Hunger Games. A teenage boy and girl is selected by lottery from each district. The 24 tributes are placed together in an enclosed landscape, where they have to fight nature–and each other–to survive. Twenty-three will die. Wealth will be showered on the single victor and his/her district. And the whole thing is televised: entertainment for the capital, mandatory viewing in the districts. The book centers on Katniss; when her beloved twelve-year-old sister is selected for the Games, Katniss desperately volunteers in her place. You see by now why this seemed darker than what I normally read? It is a very grim premise–but a brilliant book. And not so unlike other things I’ve read; in fact, I kept getting the feeling I’d read it before. Life in Katniss’ district (the very poor 12) reminds me of Gathering Blue by Lois Lowry. The Hunger Games remind me a lot of Surviving Antarctica, though more cut-throat. I’m even reminded a little of some aspects of Uglies by Scott Westerfeld. But this one does stand out. I think what impresses me the most are the characters, and the deft handling of multiple conflicts. Almost every character, even the minor ones, felt vivid and alive. Katniss is a powerful character. Life is a struggle in District 12, and she’s been fighting to keep herself and her family alive since she was twelve. Her father is dead and her mother provides limited material and emotional support. Katniss is forced to be tough, and is in many ways wary of others–but she also fiercely loves her little sister, and cares about her best friend, Gale. The conflicts Katniss is enmeshed in are many and varied. There’s conflict on the political level–even if I hadn’t picked up information about the later books in this series, the society and the past rebellion make it clear enough that a new rebellion is coming. That’s mostly in the background of this first book, but it’s there. There’s the day-to-day struggle to survive, first to fight starvation in District 12, and then the even more immediate danger in the Hunger Games. Katniss has to literally fight to survive, using knives, arrows and her wits. And there’s the love triangle. Did I mention her best friend Gale is a boy? Collins develops their relationship well, as friends beginning to be something more; I’m especially impressed by how well Collins conveyed this, considering Gale is only in the early chapters, and briefly in memories and references later. He’s left behind when Katniss goes to the Games with Peeta, the boy selected from District 12. They play up being in love as part of a strategy for the Games–until Katniss begins to be unsure what’s the Games and what’s real. I always like triangles best when a character is pulled equally in two directions. When a girl’s madly in love with one boy and just really fond of the other (ahem, Twilight, I mean you), I don’t really see the point. In this case, I really can’t tell how it’s going to come out–and no one tell me, I haven’t finished the trilogy yet! All of the external conflicts lead to a lot of tangled internal conflicts for Katniss–wondering how she feels about Peeta, worrying about her family, resenting the capital, struggling to survive…and none of it feels foolish or superfluous. It could very, very easily come out sounding stupid, with me yelling at the book, “Why are you worrying about romance while people are trying to kill you? !” but it really doesn’t feel that way. The romance is given a little more weight than I’d like at the very end, but overall it’s handled beautifully in a way that feels very reasonable and natural. This is a dark book, and I’d definitely consider it older YA. Despite being about teenagers killing each other, most of the book is actually not too gruesome or graphic. People bleed and die, but not too graphically. However, there is a more disturbing scene near the end, so be warned. Most of the book is powerful but not too far over the edge into horrible, and Collins actually manages well to throw her characters into a kill-or-be-killed scenario but keep them sympathetic and redeemable. The televising of the Games is another element I found especially intriguing. It’s sensationalism to an extreme. There’s some forced comparison to Rome (officials involved in the Games tend to have Roman-reminiscent names) but I find it much more powerful to compare it to our culture. Maybe it’s an easy comparison because I was reading this the same day Casey Anthony’s verdict came down. Why are we, as a culture, fascinated by other people’s pain? Why do we want to know the gory details? It has nothing to do with our own lives–why is a murder trial in Florida front-page news 3,000 miles away in California? All the horrible, sensationalist news stories are someone’s life, and it’s disturbing that it becomes a sort of entertainment for the masses. The more I think about The Hunger Games, the more impressed I am by how well it’s put-together, by how clearly characters were painted in just a few strokes, by how absorbing the plot was. I have the second book on reserve at the library–#70 in line, but there are over 80 copies in the system, so I hope to get it quickly! Update: Read my review of The Hunger Games movie! Wow! It sounds like an intense book – and trilogy. You bring up some good questions at the end of your post, about why we as a society are so fascinated by other peoples’ pain, and the more bizarre the better. Jaycee Dugard’s memoir is now published and I’m sure it will be a best-seller. People want to hear all the details of her captivity, though her story is exceedingly rare. Maybe that’s why people are interested. These “news” events are so far from their daily lives that they do become a form of entertainment, at the expense of the hard news stories.